Full moon, maybe? Finally feeling relaxed after having a few days off of work? Whatever the reason, I actually baked something today. Yes. BAKED! I know, right? I actually followed a recipe, mixed ingredients, AND used an oven and a hand mixer. Whoa! The last time I baked something? Um. Yeah, I don't know. I took photos for proof! It was all Kate's fault. 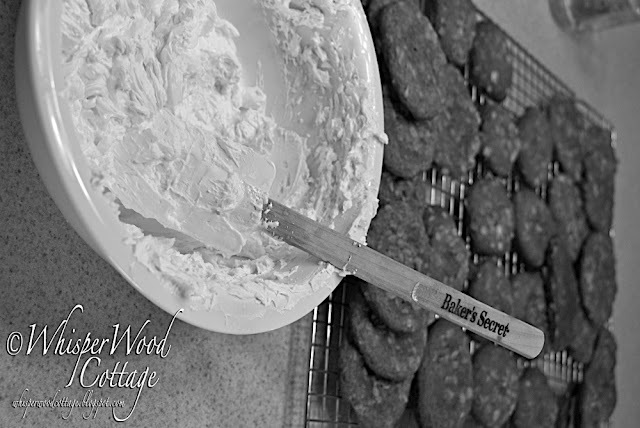 Kate@The Starr Family blog posted an tempting recipe for making your own oatmeal creme pies. With my mouth watering and a sugar craving kicking in, I said, "Ron, I'm going to bake!" After his initial state of shock wore off, he looked at me quizzically and asked, "You're going to bake?" When the incredulous concept sunk in, he gladly offered to run to the grocery store to get the ingredients. We don't normally have flour, molasses, or any type of sugar in the house. Like I said, I don't bake much! Well, Ron and I both concur that they are delicious! I tweaked the recipe a little bit by substituting butter for the margarine and shortening. Other than that, I followed it to the letter (though I might suggest a little less salt in the filling). Highly recommended! But don't worry! There is no danger of this becoming a cooking blog!! 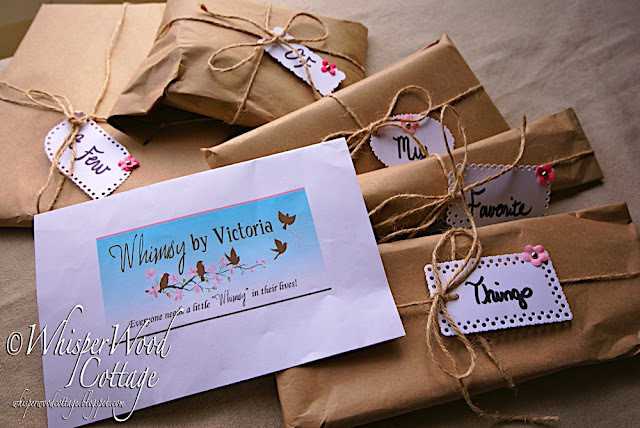 I was even able to use some of the prizes I received from Victoria@Whimsy by Victoria. When they arrived, I was like a kid on Christmas morning!! Look at the wrapping and the tags!! "A few of my favorite things" is right! After tearing open the packages, I was one happy DIYer!! I put the pliers to use within hours. 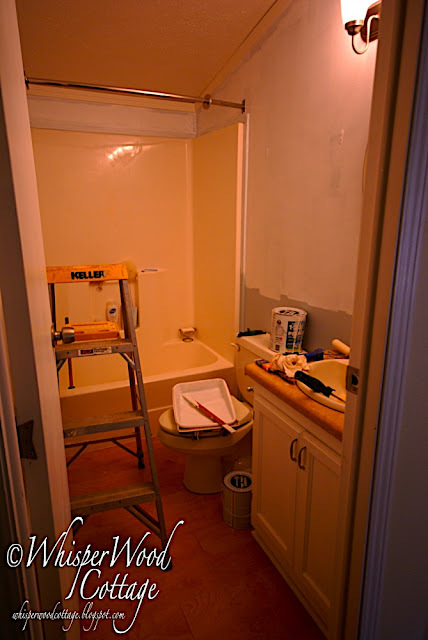 The level and the tape measure were on hand for the bathroom project and are now tucked away in my tool box. The Purdy paint brush and the spray gun will get lots of use this summer. 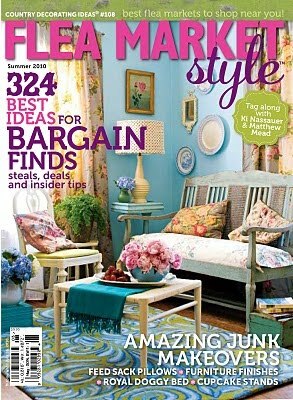 I also had some down time to peruse the new Flea Market Style magazine. I won this gem from Sue@Vintage Rescue Squad. Sue and I met through blogging, but we were able to meet in person last spring at the Texas Antique Weekend. She is the one that showed me the booth where I found those ship's keys!! I've also been cleaning out the closets and rearranging furniture. The sun and the warmer temperatures are telling me that spring is on its way! 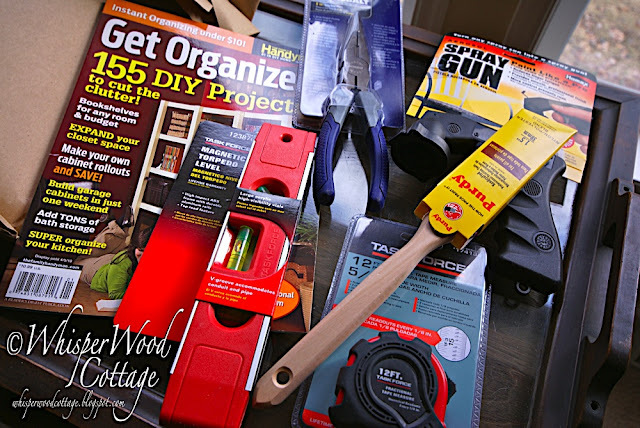 Time for spring cleaning and a fresh outlook on all things home and life! P.S. I told Dad "Amy baked cookies today!" He said, "Amy WHO?" Yum! I love homeade baked cookies, but with all the home renovations, it's hard to find time to bake! Like you, we have a few projects going on all at once. You're a lucky lady, winning two awesome giveaways. I paid $10 for the Flea Market Magazine, but I have to admit, it was worth every penny. I read this post and thought of a link that was shared to me and thought you might enjoy. I love her sense of humor. It is clean, I promise. Amy, those oatmeal cream pies look yummy. I don't bake either. Has been a very long time. If that kind of stuff is in the house I will eat it. What great and useful prizes you received. Can't wait to see your bathroom reno. Well now I see what all the fuss is about! Debbie at Talking Trash is always mentioning you and your lovely blog, and I don't know what took me so long to get over here, but I'm here now! And so glad to have discovered your gorgeous blog! 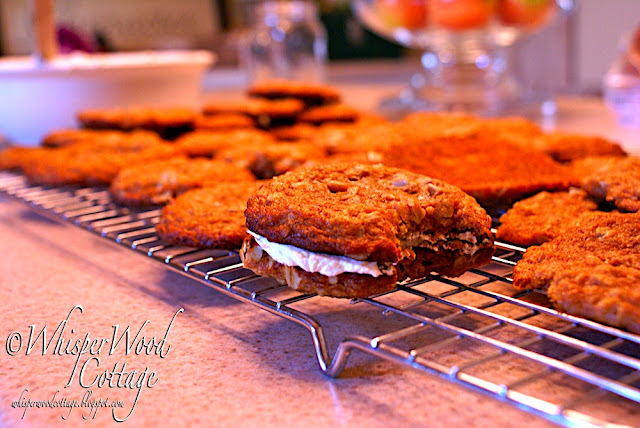 I've made those oatmeal creme pies for years, they're a guilty pleasure. And yep, butter makes all the difference. Those cookies look good! Congrats on winning that prize...so nice and they were wrapped all pretty too. I don't bake much either. I did bake a frozen cherry pie today I got at the grocery store though! Must be something in the air. I baked cookies today, too, and shared them on my blog! Amy who? LOL!! Cracked me up!! Congrats on your favorite things! as for the cookie baking - I used to bake much more but still do from time to time - can share other simple but yummy recipes if you wish! And don't even get me started on doctoring box brownie mix to make the best brownies ever! You are so sweet to link up.... did you not just love them? I would perhaps not put as much salt in the filling, but otherwise yum. Those cookies look so yummy!!!! Congrats on baking something yummy and on receiving a great giveaway! Yum!!! Those cookies almost inspired me to bake. Good job. I chuckled at your father's comment. Too funny. I loved that post! Dad should not get any cookies! They did look mighty fine! Great post, Amy. You are so funny. Nice job on the cookies!! I love those inspired days... You sound like you have had a super busy weekend! Amy...how did I miss this post? I have you in my reader list...so sorry to just now come by and say "Thank You" for showing me some bloggy love!! I am so glad you love your gifts and hope you will put all of them to great use! I am so glad to be in this blog world together and call you friend. Have a wonderful weekend!! !